But then there is the specific music I seek out, or discover, that is divinely perfect for the story. What music is inspiring your story? Artists in all fields are inspired by each other. One of the most famous examples of creativity enriching creativity involves, The Isle of the Dead. Arnold Böcklin (Swiss Symbolist painter, 1827-1901) painted five versions between 1880 and 1886. All renderings depict a rowboat arriving at a seawall. In the bow, stands a figure clad in white. Many have interpretated the white-clad figure as Charon, leading human souls into the Greek underworld. In 1907, upon viewing the painting, Sergei Rachmaninoff began composing a tone poem in its name. The work, now considered a classic of late Russian Romanticism, was finished the following year. In 1945, Val Lewton produced a classic horror film with the same title. The script, written by Ardel Wray, was inspired by the painting, and involves a group of quarrantined islanders who begin to die, one by one. Not so long ago, the answer would have been, “no”. I worked in utter silence or with the television on. (yes, there is no need to point out the contrariness of that) But then the lovely DD of Filling Spaces alerted me to the wondrous allclassical.org, and I was thusly hooked. Love that station because they play such a fantastic variety of musicians and styles, introducing me to lots of composers I’d never heard of. And they prove such hosts can be tons of fun and lighthearted. No Charles Emerson Winchester the Third-ians need apply! If PORTRAITS OF THE LIVING: A GHOST TALE has a soundtrack, then I think it would be The Hours. Philip Glass’s haunting, somewhat monotonous piano music is reminiscent of my characters trapped in their personal hells. Do you listen to music while you write? Does your novel have a soundtrack? The Italian composer, Giacomo Puccini, was born on December 22, 1858 in Lucca, Tuscany. In 1876, he was inspired to write opera after hearing Verdi’s, Aida. Four years later, he enrolled at the Milan Conservatory where he studied under Antonio Buzzini and Amilcare Ponchielli. His first opera, Le villi (1883), lost in the school’s competition but gained him great respect. While his second opera, Edgar, was a failure, he gained international success in 1893 with Manon Lescaut. Manon was the beginning of an extraordinary career. Although once dismissed by musicologists due to a supposed lack of “depth”, he is regarded today as one of the greatest composers of the late 19th and early 20th centuries. A remarkable use of orchestral colors, melodic artistry, and harmonic sensibility mark his work. His work is also distinct due to the natural style in which the characters sing short phrases to each other as though they are truly conversing. For this reason, critics state his best scenes are those in which two characters are alone. Perhaps the best example of this is La Bohème. Premiered at the Teatro Regio Theater on February 1, 1896, it is considered one of the most romantic operas ever written, mostly due to the earnest arias between Rudolfo and Mimi. After achieving great success with Tosca in 1900, Puccini’s Madame Butterfly met with initial failure in 1904. 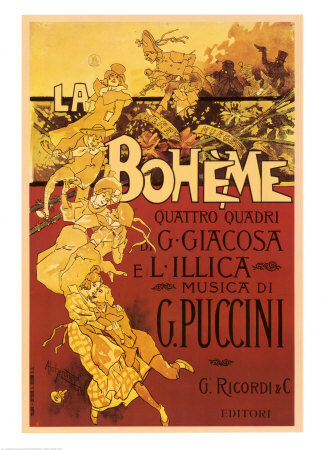 Criticized for its excessive length, Puccini cut out a song from act one, and divided the second act. He premiered the revised version at Brescia on May 28, 1904. From then on, the story of a Japanese woman betrayed by a callous American naval officer has been considered one of the most beautiful operas ever written and one of the most performed around the world. Wuthering Heights by Emily Bronte is my favorite novel. Emily’s novel and her fierce poetry have been a huge influence on me. Although my own writing style is more down-to-earth (despite the dark subjects I tackle), Emily’s dramatic and fearless writing remains an inspiration.